At the Pidato Milad (Anniversary Remark) of Faculty of Agriculture of Universitasitas Muhammadiyah Yogyakarta (UMY) on Saturday (1/9) at A.R. Fachruddin Building, Former Minister of Agriculture 2004-2009 Dr. Anton Apriyantono, M.S. stated that Indonesia is confronting challenges to comply with food security. The food security refers to a condition related to sufficient supply of food to secure lives of individuals in a nation. Under the theme of ‘Strategies for National Food Security in Industrial Revolution 4.0’, Dr. Anton mentioned the barriers. “First, Indonesia face decreasing of agricultural land. 2/3 areas of Indonesia are oceans and the other 1/3 areas are equal to a 190 million-hectare land that only 45 million hectares are agricultural land. Second, compared to the increasing and the number of Indonesian populations, issues of being incapable of filling the food need exist. Indeed, we also encounter low productivity of our primary food,” he explained. Besides, Anto responded to the emergence of demand for food self-sufficiency. 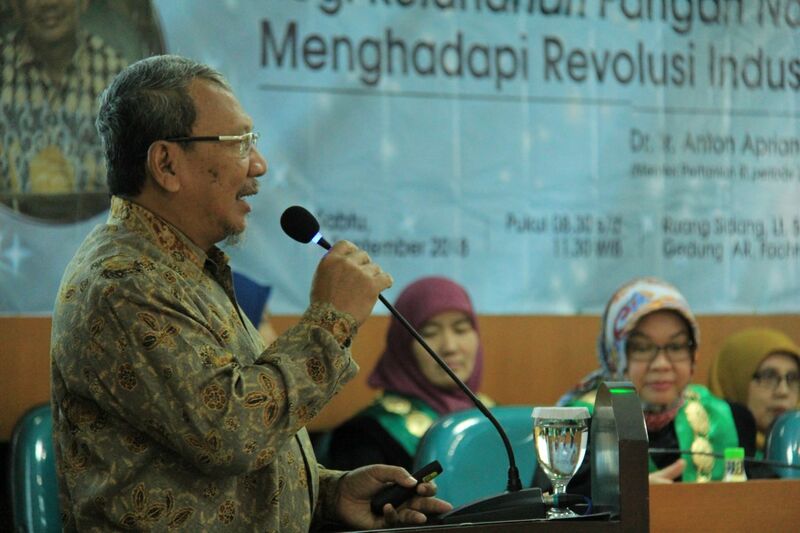 “Talking about the food self-sufficiency, we have to consider kinds of it because not all of the food self-sufficiency is available and can be produced in Indonesia. For instance, wheat is a staple for various products. It can be cultivated in Indonesia, but it is hard to meet domestic demand due to a lot of problems regarding cultivation, weather, and lands, so do soybeans and corn. Thus, import is one of the means to comply with the needs,” declared Dr. Anton. He also conveyed that what to do is to prioritize food products which become Indonesian potential. “Indonesia is the greatest producer of palm oil, the second position of a rubber producer, the third greatest producer of cocoa, and the greatest producer of vanilla, the supplier of 90 percent of patchouli oil in the world, the main producer of spices. Hence, we should focus on the products and the primary food of Indonesian people,” asserted Anton. To achieve the food security, Anton told several strategies. “There are there aspects to reach the food security. First, we have to improve production areas such as agricultural land, cultivation techniques, and policy to support the food security and to provide subsidies. Next, in a consumption aspect, we should shift our mindset that ‘it is not considered eating if we have not eaten rice’. We have to diversify our consumption pattern because we have a lot of kinds of food besides rice or wheat. Last, food distribution should accommodate all Indonesian people wherever they are. Therefore, we have to provide sufficient transportation and distribution center,” he emphasized.